Being a genetic genealogy nerd, I wanted to do something related to DNA for my grandkids for Christmas. Most of my grandkids do not have all four grandparents living. However, all of them have at least one maternal and one paternal grandparent living. We know the grandkids get one copy of each autosomal chromosome from each parent. We know those chromosomes are a recombined mixture of the DNA the parent inherited from the grandparents. When one maternal grandparent has tested, we know which segment of DNA the grandhild inherited from that grandparent. We also know the maternal DNA not shared wth the tested maternal grandparent came from the untested maternal grandparent. The same logic can be applied to the paternal line shared DNA. 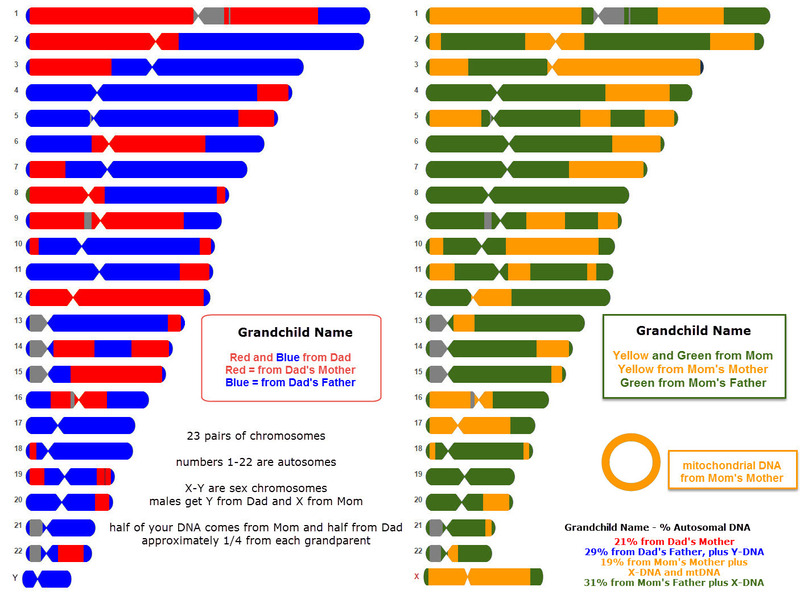 For my grandkids where I have tested a grandparent on both the maternal and paternal side I made a chromosome map to add to their Christmas gifts. This is how I did it. You may add your own enhancements and make alternate color choices. I may make some of these text boxes a little snazzier, but you get the idea. If you have a good idea for an enhancement please let us know in the comments. At Family Tree DNA I have access to the shared segment data and I like the shapes they use on the chromosome browser. You could do something similar with data from 23andMe or GEDmatch.com. It will look a little different, but would still be a unique educational gift. In an image editor (I used SnagIt editor) make the changes below, frequently saving the image so nothing gets lost. You need to understand how to use an image editor to complete this part. Numbers on the image here correspond to the steps below. Click on the image to see a larger version. I also made the X chromosome smaller in size by drawing a selection box around it then moving the box edges to squeeze the chromosome horizontally so it became smaller. 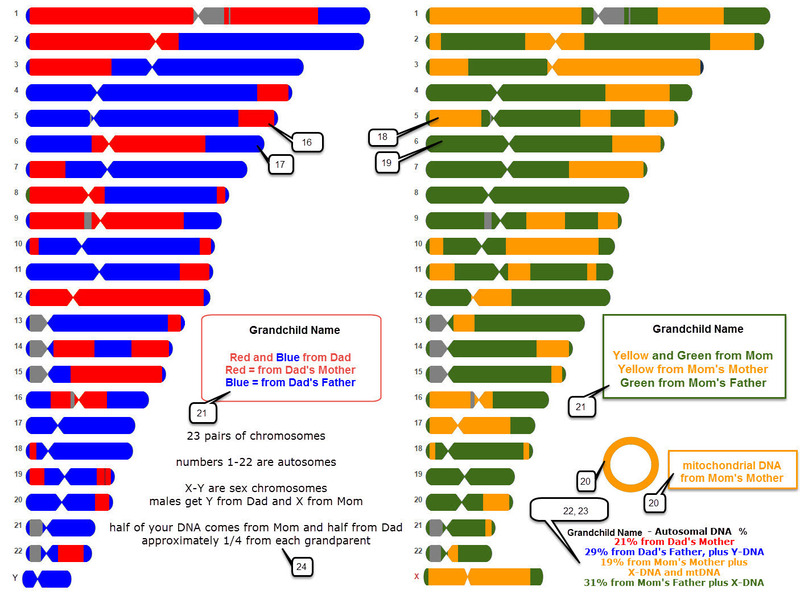 Technically, it should be about the same size as chromosome 7, but I wanted more space to include text on the percentage shared with each grandparent. Print the resulting image on heavy paper used for certificates or awards; my paper has pretty gold curlicues in each corner. I selected to scale the image to leave borders on all edges so I could frame the image. On my printer, I have an option to print in draft, normal, or best mode. For these, I selected best mode to get the highest quality prinout my printer will make. I framed the images and printed a second copy that would allow siblings to hold the papers next to each other to easily compare which DNA each inherited from each grandparent. I am planning to add some additional explanatory text to send along with the images. And, of course, I will refer them to the appropriate pages in the copy of Genetic Genealogy in Practice for more details. After all, I did give a copy to all of my kids and some other family members once the book was in print. I might as well give them a reason to read it. 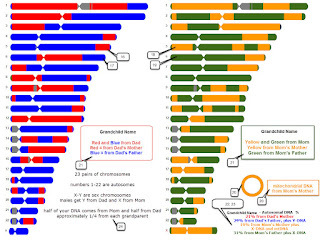 Debbie Parker Wayne, "DNA Chromosome Map Poster for Grandkids," Deb's Delvings, 14 December 2016 (http://debsdelvings.blogspot.com/ : accessed [date]).